After a rough start to the year, my approach to May was to just tough it out. I decided to push some on my running and hope that things got better. As a result, I had many runs on very tired legs that I just forced myself to run anyway. On a couple of days, I ran twice - once in the morning and once in the evening. Did it work? Well, I can say I had a week mid-month that went very well and I was feeling much better. But then I kind of dragged again the week after that, so I'm not sure. June will be a cut-back month for me, and I'm hoping to see my legs bounce back. At any rate, I'm pleased to see my mileage higher (because I'm behind for the year!) and I don't seem to be having any injury issues, so that is a positive. 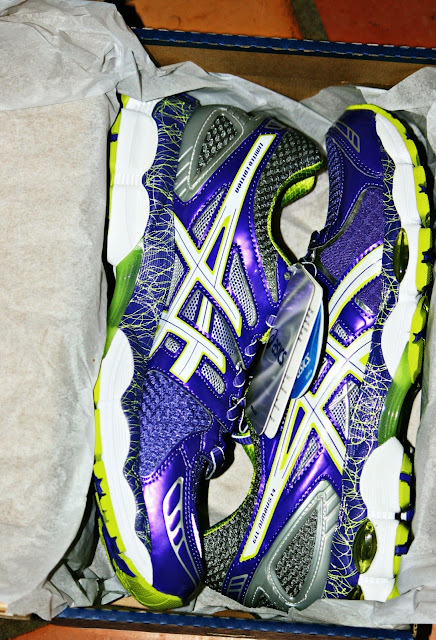 I also treated myself to some new running shoes this month. They are PURPLE. Not my usual choice, but it was what was available when I ordered them online. And they seem to be doing the job. A part of me has missed all the racing this season. By now I've typically run several races. But I haven't done a single speed workout, so I wouldn't be ready. June is going to be a very busy month, but I hope I can hit the track a time or two. Readers, are any of you behind on your goals for the year? My Daughter has gotten back into running again. I don't think she puts in the miles that you do though. I am so behind. I think I need to rethink them. I've stopped setting goals, I'm going with the flow and I, personally, like it better this way! I did however had my 1st jog last night (well, my 1st in a looong while).. needless to say, I didn't last long.. going again this evening! I have a goal to walk 3 days and start some kind of strength training for three days, I need it badly!! I am an avid walker and had a great May. Later this month I will walk in my first 5K Fun Run and Walk. I just have not got the courage to run ... yet. Walking is so enjoyable it seems like I hit a wall when I think jog. Neat shoes and have a wonderful June. I love your shoes, Lisa! I've noticed lots of bright shoes around town lately-turquoise and orange and lime green. They make me smile! I'm glad the weather is getting better-I'm enjoying going for more walks and working in my garden! Oh Lisa I think you are doing very well for working with that injury I think things will get back to normal soon. WAAAY behind on my biking mileage! I was shooting for 400mi/mo and I have been nowhere near that. I haven't done a t-shirt ride yet, though one is scheduled for Saturday. Your activity level is impressive. My goal is to walk 30 min a day. Don't laugh! And no, I'm not meeting it because it's too hot already. Love the shoes! I think you're doing great with your running! And i love the color of those shoes. I got a new pair last year before my foot started hurting. They're kind of a turquoise--not real excited about the color. As you know, I'm still in the boot. I go back to the doc on June 14. Hope he'll turn me loose from the boot and I'll just have the weird fracture shoe to wear, hopefully just a couple of weeks. Then I will walk for a while. I want to lose some weight before trying running again. Cute running shoes! I like the colorful ones. I hope you can get back on track with the goals you have set for yourself, but as it is I think you are doing a darn good job! Love your shoes...and your determination! I'm kind of where I want to be right now. My boss approved that I can take 1/2 hour lunches and leave early on Fridays. That will be so nice! Then I can get things done. Congratulations on more running! I love the purple shoes. Hope you have a good week. It's hard for me to relate because I'm not a runner, but my daughter has that itch to be out there doing it too when she can't, so I kinda get it. I should get a new pair of "walking" shoes. I'm proud of you for doing all of that exercise ---while taking care of 3 sons, a home/ a yard/garden/furry friends/a job----etc.etc.etc. WOW--how do you do it???? Yea for the new shoes and no injuries. I am wondering where you swim. Such a good mix. Don't you just love new running shoes?! I always love the extra bounce they seem to have! I will loan you a scythe and you can really get a work out cutting your hay and make your husband happy at the same time. I can feel it in my legs after I cut. I just started running outside again last week and I've been pretty good about getting out 2 times a week. Today I brought my oldest with me and he beat me by a country mile, but I didn't care and he was pleased with himself, too! Funny I just blog hopped here via your badge on Rural Journal. The funny thing is I just ran my first and last 1/2 marathon. You have my admiration. Getting ready for this one run started in October. I enjoyed doing it, but it will be my last and knee pain this last month made if unbearable. Still I finished. Your post was inspirational. Thanks. Those are fascinating running shoes. Very fancy! Designed for a very dedicated runner. I'm a bit too 'mature" for much running. Besides, in my life a lot of people have given me the run-around, so i've done a lot of running in that regard. I am in awe of your determination, Lisa. I hope you feel well and truly satisfied. Me and my goals? Some days I feel like I'm so far behind, I'm in the lead. And some days I feel like I'm keeping up. I've had a bad winter, but , in reflection, I feel l have accomplished some important things, and have set up some other, important goals. This is good. Oh...my knees hate running...I walk! I only recently started running, and am quite slow. My goal is to run an entire 5k by the end of this summer. Right now I can only run about half of it. Good luck on your runs! No real goals set this year. Just trying to stay afloat! Well, you've run 112 miles more than me! Sometimes you just gotta do what you can do. I know it is disappointing not to get those fitness goals met, but sometimes life and injuries just get in the way. I hope you can turn it around now.